More data has been created in the last two years than all previous years of human history combined. Just take a second and think about that mind-blowing statistic! This is data on spending habits, social interactions, device performance and much more. The vast majority of this information is collected by businesses and could be used to improve product offerings, leverage cost reductions, save time and help make better business decisions. Studies indicate that retailers who embrace big data can expect to outperform their competition by an incredible 60%. However, despite the vast potential for business growth, most of this data isn’t being used effectively. This raw data needs to be efficiently processed to create value that results in meaningful, positive changes in an organization. Experts estimate that just 0.5% of all data is analyzed and this percentage could continue to shrink in the future. Many businesses miss out on some of the biggest benefits of big data because they lack the time or expertise to categorize it and leverage it. Which would you rather be focused on in your business -- the tedious details of data extraction or leveraging that information to make it actionable? Business leaders today want to focus on growth, not managing data processes. Because of this many companies are now outsourcing their data processing to experienced specialists rather than doing it in-house. 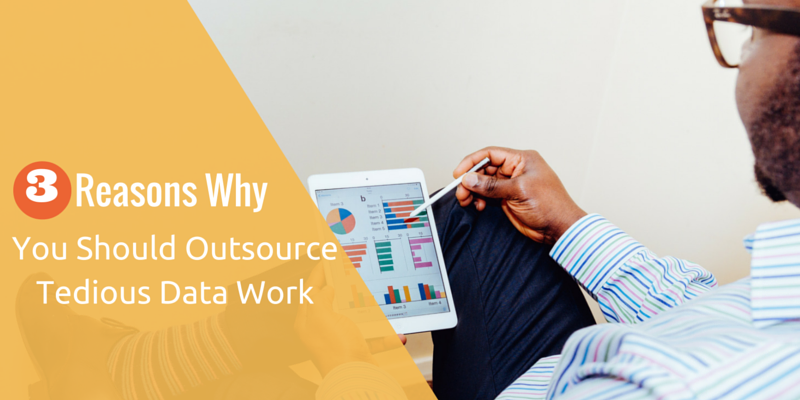 Let’s take a look at the top three reasons why these businesses are choosing to outsource the burden of processing and categorizing data. With data doubling every 18 months , collecting and analyzing it is an exponentially growing challenge. To manage that process, you need a skilled workforce, but hiring and training the necessary workers to keep up with that growth is unsustainable for many businesses. The job is particularly tough when you need to increase capacity quickly. A partner who has a well established process for hiring at scale can help save time and money. Why go through the pain and expense of building a workforce when someone else has done that difficult work already? Learn about 4 ways to scale your startup. Your business is growing because you’ve focused on delivering a fantastic product or service for your customers in a particular specialty. Diluting your business by investing significant resources in an area that isn’t your core competency takes focus away from innovating and providing an exceptional customer experience. When you decide to divert focus to processing data, you’ll need to hire new staff, create and streamline new processes, and invest in new technology. It will shift your attention away from what your business does best. This can be costly in terms of money and resources, or, potentially worse. Taking your eye off the mission of your business can lead to a severe competitive disadvantage, especially when those competitors figure out a smarter way to get work done. Data is valuable only to the extent that we can make sense of it, otherwise it’s just taking up space...a lot of space. In the face of big data, one of the biggest challenges is categorizing data at the point of ingestion. Most businesses don’t know how to handle the endless streams of data coming at them, let alone make it actionable. Yet much of this unstructured data presents tremendous business opportunities, particularly in the area of analytics. By outsourcing data work, you can focus on making sense of critical, unstructured data that provides valuable insights for your business, for your customers, or both. Most importantly, you can do this before it enters the black hole of bottomless storage silos. Finding a partner who specializes in tackling this challenge can help deliver accurate and actionable data that can give you the competitive edge you need in a world awash in big data.